School A (Middle School) has Hide standards grades in Parent Access unchecked. School B (Elementary School) has Hide standards grades in Parent Access checked. Parent signs in to the EPP and looks at his middle school kid. The Standards Tab appears in Grades and Attendance but the students has no standards grades and the parent gets a messaging saying so. However, when the parent clicks over on his elementary student, the standards grades are all there for the parent to see, even though the setting was checked to hide the standards grades in Parent Access. Similar problem with Course Requests (class registrations). The parent can see and change course requests, even if a school has denied access by going to his student that does have access first. Is there any way to store the Username of the Parent who last submitted a demographic change instead of their Firstname Lastname? Is there any way to get the Guardian Username instead of Firstname Lastname to store to the parent_wholastchanged field? We enabled this feature in the parent portal. Now parents who have multiple students in their accounts have access to screens they should not be able to see. It is like a back door into screens that parents should not have access to, but do because another student in their account does. For instance, we opened the student registration for students entering 10, 11 & 12. Because a family has a student in those particular grades, they were able to click on that screen, then click on their other student who was not in one of those grades, find their screen, and register even though it was not open. Same thing happened on Standards Tab, we closed the portals for standards which we use at the elementary level. However, because a parent had that Standards tab for a middle school student, they were able to click on it and see their elementary student grades. Hi. Has anyone experienced duplicate menus showing up down the left hand side? This also causes our content, which appears to be vertically centered in the frame on the right, to be much lower down, sometimes below where the user will see without scrolling. If anyone knows how to at least get our content to be vertically on the top of this frame, it would be very helpful. Thanks! Did you try different browsers to see if this is browser specific? Yep. Happens on all browsers that I looked at Safari, Chrome & Firefox. Any ideas? I tried different browsers but still getting this problem. Any ideas for where I can look? I am trying to add another icon and it just is not working. Are there instructions on how to do this? I copied the #btn statement and the if statement for the school info and made minor changes to the names (changed all "school info" to "school info test" for names but left the pref part of the if test checking the school info test). I have uploaded all these wildcard files and the icon and page with the school test name. I also submitted customization but it will not show up. What am I missing???? I used the tip above to put an alert on the home screen when a parent has made changes to demographics. It slowed down the loading of my start page to approximately 6 sec per load. Has anyone else encountered anything like this? I've removed the indicator for the time being because the slow-down was unbearable. We are running Enhanced Parent Portal v 3.3.2. 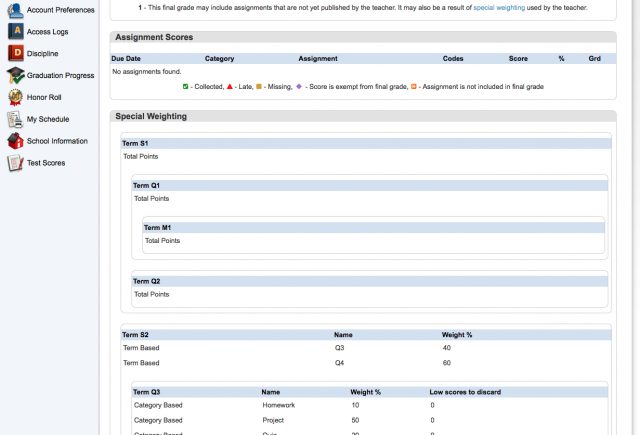 I have been asked by administration to add a page for Progress Reports. I was able to successfully change the Parent Portal Settings screen on the Admin side. I stole the 'Balances' slot and renamed it 'Trimester Progress Reports'. I don't know which pages I need to modify and with what in order for the page to show up in the navigation on the Parent Portal. Can you provide some information as to how to go about doing this? It appears that it is not easy!! I am currently using the enhanced parent portal which has been wonderful. This year I have added a custom online enrollment icon/link to the parent portal and it is working fine when a parent logs in. I was trying to make changes to the "portals.html" page so I can turn it off until we are ready for parent to enroll their students for the upcoming school year. The name shows up in the Parent Portal Settings page and I can choose ALL to checkmark all schools. The issue is when I checkmark it, it still shows up in the parent portal when a parent logs in. Any help would be appreciated even if I need to pay for help. I desperately need this to work before next week. Please help. It is not working now. We opened online enrollment and now it won't let me turn on the demographic update. Need help ASAP. I see what coding needs to be added to the admin/home page by the notes above, but where should it be placed on the page? Nevermind I got it working again. Pushed the panic button too soon. I would like to put a flag on the admin page to signal when a parent has made a change on the demographic update page. Will someone share the code and where to put it. When the 'Graduation Progress' icon is clicked, the planselect.html page displays. There are no options to select (which I find odd to begin with), so we just click the submit button. The page then refreshes to /guardian/academicplanner-pkg/planprogress.html.action?nav=gh Of course, that page does not exist, so we get a 404 error. If memory serves me correctly, last year the planselect.html page on the guardian side did not display any selectable options, but when the submit button was clicked, it did display the correct plan progress page. Hi - did you ever figure this out? We just went to 7.10 and the Schoolnet link will not show no matter what I do...THank you!! Is there a way to report attendance on a transcript for each year a student was in High School? Of course you can edit the actual dates used on each line to correspond with the school year you want to use in your report. Has anyone else upgraded to 7.8.2 yet? I did it over the weekend and now the EPP doesn't work correctly. I am unable to use the System->Portal to turn icons on/off. I am unable to use the Demographics part of the EPP. UGH.... wish I could go back to earlier version! I have tried what I know to do, but since upgrading to 7.8.2 I cannot get the icons to show on the Parent Portal anymore. They are set at the default and I cannot change them using the Page at School->Parent Portal Settings. Did you reinstall the customization? Attach Report Cards to Portal? Has anyone figured out how to attach a report card to the parent portal? Ideally it would be a link to a pdf. Could it be something like the way photos work? I guess one of the problems is splitting a report card run into individual pdfs with student number. Any suggestions appreciated. Then putting a link on the home.html page to the pdf file by using this link. Vinit, would you be willing to write up some instructions on how do this? I would be very interested in this as my Superintendent is pushing for something like this. I too would like to learn how to link to a student-specific PDF inside the parent portal. Is there a way to add a SchoolNet link into the public area of the Enhanced Parent Portal customization? Hi - I need this also...did you figure it out? Thank you! I have added this to the subs.home page to show the room number and the red/green dot. Sometimes the page works just fine...other times they get the HTTP Status 500 error for "arrayindexoutofbounds". Any help would be appreciated. I added this right after the course name. We upgraded to 7.8.2 and applied the EPP 3.3.2 and now the "show detail" on grades won't work. Anyone else having this problem? Any way you can Exclude a course from the Parent Portal like Excluding from Report Cards? I'm hesitant to install it without knowing if it will break the portal. We have not had an issue with the EPP and 7.8 or 7.9. You were right. I just installed EPP and the only issue is that some of the icons don't display. I think I might need to add them manually. Otherwise, thanks for the heads up that it is working! Request Screens - Student Field Value - did it change? Steps 1 and 2 have been completed. When I try to do step 3, there isn't a field by that name (Sched_AllowRequests) to modify. Has the field name changed? If so, what is the new field name? When I try to do the modification to the student field, sched_allowrequests, that field isn't there. I also can't find anything on the Student Scheduler Setup screen to check to allow students to submit requests. The request screens work if I turn off customizations. They do not appear and the error message appears if the customizations are turned on. sched_allowrequests is a custom field. You have to create it and populate on at least one student before it appears in field lists. Two ways to do that 1) submit a page with that field on it, 2) use Custom Fields and Screens / Student Fields. BUT ... On 7.10 when we used choice 1), it created two fields: one with the name we expected and one with a name designed for the new custom field management that is coming. I can't get the parentdemographics.html page to display. The link doesn't appear in the menu, nor will the page load if I try to enter it directly in the browser address line. I just get the Information Not Available error message. Is there any way to have just S1 and/or S2 list? I have Q1,Q2,Q3,Q4,S1,S2 list. If I could choose which to list, that would be ideal. I am guessing I may be able to add to the code to make that happen but it is beyond what I have figured out. Upgrade to new custom field structure? Has anyone migrated their server to the newest version and upgraded their custom fields? I am wondering if this will break things? We currently have an outside fee service called Acorn from Rycor. They installed a link on our parent portal that takes parents to their site. When I installed the EPP it removed this link. The IT people at Rycor cannot figure out how to make it work with EPP. They are telling me just to remove this customization - but I don't really want to. I love the EPP. Any suggestions? that may be what you need if they installed it as a plugin. I don't think the above additions will hurt anything, and they just might solve the problem. If adding the the code does not solve the problem, you could insert the link yourself using the insertion point once you have it on the page.